We wash our nervous orbs about, threading gushes and sprinkles of light into tumbling brains. We coax conversations from darting figures, our friends, phantoms. We plunge a camera into the churning and pull into the machine. May the conversations spill without prejudice in the direction of our new friend. Let us talk about machines, emotions and light. Install a video camera in the center of a party. For the duration of the party take close-ups of the guests' eyes and ask them for their reflections on being scanned. Produce a variety of media from the scanned material and distribute to the guests. The goal is to allow the media to gently warp perceptions of being during and after, the party. Same as above, but install three cameras, each focused on a different organ (eyes, ears, mouth, elbows, etc.). Print images during the party and affix them to their source so that "Eye People" can be differentiated from "Mouth People," etc. Feel free to trade organs. 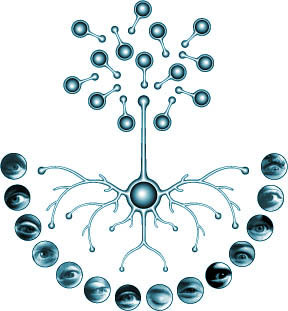 PROTOTYPE: The diagram above documents an Eyeball Scanning Party which was conducted in Nerve Circle studio in Williamsburg, Brooklyn, 1991. Fisher published the eyes and associated reflections in Machines and Emotions, a special issue of Kit Blake's Worm Magazine in1992.